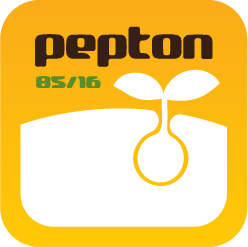 Pepton 85/16 is a new organic leaf fertilizer with high nutritional content. With Pepton you can buy valuable time when the growth potential is present but the plant needs immediate nutrition and energy supply. In other words, Pepton is a finished raw material for the plant for growth and development. Typical situations where Pepton will be beneficial is when the plant has the potential for growth but can not get all it needs. It may be early in the spring, when low temperatures in the soil cause the root cannot get properly started, after drought, mineral deficiency or if the plants have been stressed or weakened. With Pepton, the plant will pick up quickly, grow in tandem with its full potential and at the same time lay the foundation for long-term further growth. Pepton strengthens all parts of the plant, thus adding vitality and growth. Pepton is used on all types of leaf fertilization of crops; grass, cereal, potato, fruit, vegetables, etc. Unlike fertilizer to be absorbed through the root system, leaf fertilizer with Pepton will provide quick effect. Pepton is commonly used in combination with other fertilizers or pesticides since the amino acids in Pepton open passage through wax layers into the plant's cells, thus simplifying the absorption of other substances. With 85% amino acids and 16% free amino acids, Pepton is the most nutritional formula in the market, with 100% of amino acids present in its most favorable form (L isomer). The amino acids in Pepton are very simple for the plant to absorb because they are produced enzymatically from hemoglobin, a digestible protein. Pepton will also provide additional supplements of iron and potassium, which contribute to deeper greenery on the plants and more efficient photosynthesis. Peptone produced under strict control with quality ingredients. Pepton is supplied in the form of micro granulate and is 100% water-soluble, storage stable and easy to use. Pepton is also used in drip irrigation. Pepton is approved in organic agriculture by (EU) No. 834/2007. Pepton 85/16 is a plant biostimulant with a high concentration of amino acids, obtained from enzymatic hydrolysis, which liberates and amplifies different reactions in plant metabolism, its biostimulatory effect has a similar effect to that of plant hormones and natural growth regulators. Pepton 85/16 is manufactured under strictly controlled conditions using high-quality raw materials. Pepton 85/16 can be used in all types of crops; grass, cereal, potato, fruit, vegetables, etc. And it is especially suitable at times with plant stress such as cold, drought, phytotoxicity, etc. Excellent to use when planting. Fertilizer approved in organic farming at (EC) No. 834 / 2007. level. 2 - 4 kg / ha / application.